90-Degree Angle Mount: With a front mount attachment system, the stump grinder is mounted at a 90-degree angle to the operator for increased visibility to the cutting area. Auxiliary Hydraulics Operation: Stump grinder operates off the carrier’s auxiliary hydraulics, eliminating an engine to maintain while operating. Carbide-Tipped Teeth: Efficiently rip through hard wood, providing long life and uptime protection for the attachment. Front Mount System: Easier to maneuver into tight areas and to position stump grinder over the stump, delivering accurate grinding action and operation. Unique Valve Design: Minimizes the cutting wheel from stalling while in the cut. 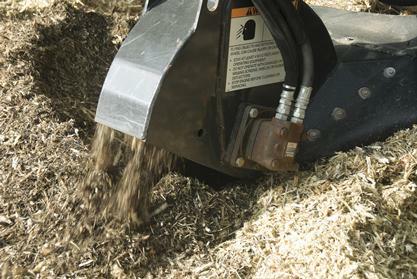 Rubber Deflecting Shields: Provide additional operator comfort and protection from wood chips.